Beer writers and bloggers tend to take one of two approaches when it comes to pumpkin beers. On the one hand, google “best pumpkin beers” and you’ll see that cyberspace is replete with lists of the best and worst pumpkin beers in North America. On the other hand, you don’t have to look very far to find tweets and facebook posts denouncing pumpkin beers as some kind of abomination, the Brittany Spears of the craft beer world if you will (even the most cinnamon averse soul would hesitate before comparing pumpkin beers to Miley Cyrus, I’ll save that analogy for chili pepper infused lagers). Our brewing process for Squashing Pumpkins is pretty unique and labor intensive. First, we roast Ohio-grown butternut squash, caramelizing its sugars. It is then mixed in with grains and pumpkin in the brewing process. Whole cloves and sticks of cinnamon are added at the end of the boil along with a blend of ground spices. I developed the recipe to make a pumpkin beer that is flavorful, but not overwhelming — it’s not as sweet as most beers of this style. When the moonlight glows and fallen leaves crackle, mischief is in the air and no jack-o-lantern is safe from splatter. This burnt amber-colored ale features roasted Ohio-grown squash and a touch of pumpkin. Whole cinnamon sticks and cloves give the medium-bodied beer a refined palette of seasonal spice that’s rejuvenating, not overbearing. It’s sure to make you flip your gourd. Squashing pumpkins pours a golden-orange color, with enough haze to give it a translucent appearance. A finger or so of white head forms on pouring but recedes pretty quickly. The nose is tantalizing. The spices mix with the bready malts to conjure memories of pie crust fresh out of the oven. I can only analyze and enjoy the smell so long before diving in for a taste. The base beer sets up a fairly blank canvas for the squash and spices. 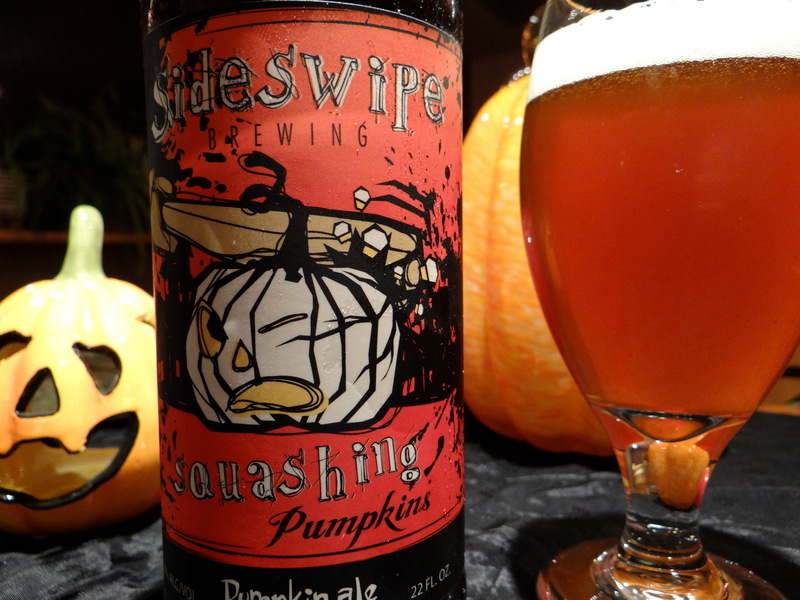 The roasted squash gives the beer a kind of fullness that is pleasant, but subtle. Maybe that’s not too surprising, because butternut squash itself has a fairly neutral flavor profile. The cinnamon and cloves come out at the finish, but thankfully they never overpower the beer. The mouthfeel is a little richer and fuller than you might expect for a 6% abv beer, but the medium bodied description on the label is a pretty accurate. This beer has a lovely nose, but in my opinion the taste doesn’t quite deliver on the promise of the nose. It’s not too sweet and the spices are dialed in at the appropriate level, both of which make it very drinkable. The squash adds an interesting yet subtle flavor that you don’t normally find in a beer. If you like the flavors of your pumpkin beer restrained (more beer than pumpkin pie) you won’t go wrong with this beer. Given the creativity and passion Craig put into this beer I wanted to love it, but ended up just liking it. However, for those of you looking to increase your daily intake of vegetables in the most enjoyable way possible, look no further than Squashing Pumpkins. Despite my difficulties in tracking down a bottle Craig assures me that it will be available through Thanksgiving, and will definitely be pouring at the brewery taproom, which is open every Thursday night.